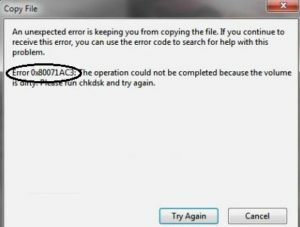 Error 0x80071AC3 often comes up when someone tries connecting an external hardware to Windows 7, 8 or 10. The error can come up when one tries to connect an external device like hard disk or USB stick. The error is causes by ReadyBoost feature and it can lead to conflicting issues in the system and cause system errors. The error can also occur when the operating system is unable to access files and other data due to bad sectors on the hard disk. The error will be followed with the message, ‘Volume is dirty’. Here are ways you can fix this issue. Try to fix the issue with disk tool. This tool can identify and fix any system errors and can fix the error code. It can also fix the bad sectors on the hard disk or external drives. 5. For a more Extensive Scan, use ‘Total System Care Tool’. 6. Check if the error is resolved. 3. Click on ‘ReadyBoost’ tab and then select the option, ‘Do not use this device’ and accept changes. 5. Accept the changes and check if the error has been fixed. If you are unable to copy files from bad clusters due to old or faulty external drive or USB device, then try this solution. 3. Type, ‘chkdsk x: /B’. The B switch is used to force the check disk to re-evaluate the faulty clusters and repair them. 4. Once the process is complete, check if the error is fixed.